and discover Reculver Towers, the site of a Roman Fort built to guard the Wantsum Channel that once divided Thanet from the rest of Kent. To the west of Reculver Towers are the seaside towns of Herne Bay and Whitstable. Herne Bay is a hive of activity in the summer months. Visitors can enjoy traditional fish and chips or an ice cream as they soak up the sun while walking along the promenade in this very traditional seaside resort. Whitstable has a distinctive character making it a popular tourist destination. Famous for its oysters, Whitstable’s maritime history is celebrated with the annual Whitstable Oyster Festival which continues to grow in popularity. A lovely working harbour, charming cafés, pubs, great restaurants and many individual quaint shops all serve to make this town so special. This brochure details key attractions that can cater for groups as well as accommodation and places to eat. We look forward to welcoming you to the district of Canterbury. The Cathedral offers a wide variety of facilities for groups, from guided tours, private evening tours, audio tours and audio-visuals in several languages to lectures, choir workshops/recitals and `behind-thescenes` tours to the Cathedral archives, library, stained glass studio, stone conservation workshop, vestry or organ loft. Programmes can be tailored to meet the group’s interest, budget and available time. The Cathedral also provides high-calibre resources and support for educational groups from primary schools to universities, enabling them to interpret the building and enhance the quality of their visit. Specialist subject matters range from history and architecture to art, religion and tourism. Please visit website for programme details, times and rates. St Augustine’s Abbey Longport, Canterbury CT1 1PF Tel: 01227 767 345 Email: customers@english-heritage.org.uk Web: www.english-heritage.org.uk/staugustinesabbey Group tours are available to one of the oldest monastic sites in England. Highlights include the grave of St Augustine and four Anglo-Saxon Kings of Kent, beautiful atmospheric remains of the impressive and important monastery that include the crypt, various chapels, the nave and cloister, as well as an impressive view of the city of Canterbury. 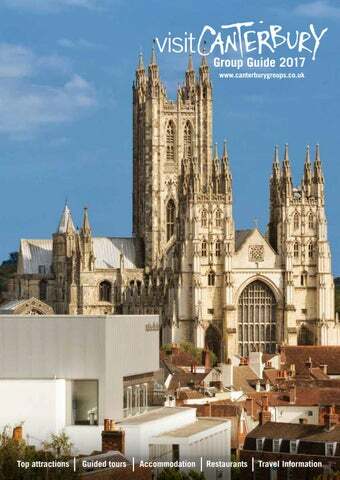 For further information, please visit our website www.canterburygroups.co.uk or contact Canterbury Visitor Information on +44 (0) 1227 862 162 email: canterburyinformation@ canterbury.gov.uk Published 2016 by the Tourism Team. Canterbury City Council cannot guarantee the accuracy of the information in this guide and accepts no responsibility for any error or misrepresentation. All liability for loss, disappointment, negligence or other damage caused by the reliance on the information contained in this guide, or in the event of the bankruptcy or liquidation of any company, individual or firm ceasing to trade, is hereby excluded. Please check carefully all prices and other details before making your visit. Your guide will explain the abbey’s historical and religious significance enabling you to catch a glimpse of what this glorious building may once have been like. The tour lasts approximately 90 minutes. Minimum of 11 people and a maximum of 30 people. Four weeks advance booking required. The Canterbury Tales St Margaret’s Street, Canterbury CT1 2TG Tel: +44 (0) 1904 261 262 Email: groups@continuumattractions.com Web: www.canterburytales.org.uk The Canterbury Tales brings to life five of Chaucer’s best loved stories with tales of love, romance, jealousy and trickery, vividly re-created with all the fun and excitement of the original tales. Set inside the former St Margaret’s Church, this stunningly accurate reconstruction of 14th century medieval England provides the backdrop for a journey of discovery as you experience the sights, sounds and smells of this bygone era. Costumed characters add lively interaction – who will you meet? Group benefits: Discounted admission prices * Free admission for coach driver and group leader * Free familiarisation visit for group organiser * Packages and joint tickets with other attractions * Workshops and demonstrations (additional fee) * Free Adult ratio. This multi award winning guided tour provides a truly entertaining experience for visiting groups and is perfect for all ages worldwide. From their convenient city centre location, only a short distance from Canterbury’s coach drop off points, their tour combines an enjoyable light hearted commentary on some of Canterbury’s finest architecture with outstanding views of natural scenery. Group tours led by qualified guides are available throughout the year if booked in advance. The route and theme of your tour can be arranged to suit your specific requirements and special interests. We can normally arrange tours in English, French, German, Dutch, Italian, Spanish, Portuguese, Russian, Swedish, and also clear English for non-native speakers. For UK schools we present special National Curriculum-referenced tours and can also guide pupils around the Roman and Canterbury Heritage Museums. We offer a variety of themes including the Romans, Medieval Life, Canterbury in World War II and famous local writers. We would be very pleased to discuss your specific needs, working with you to devise tours to suit your requirements. The tour is also officially accredited by Visit England, who in 2014 nominated the attraction for their ‘Best Told Story’ accolade. For senior groups, a special ‘Welcome to the City’ service is offered, where River Tour guides will meet senior groups for morning bookings and can offer them a free orientation tour of Canterbury whilst leading them to the tour’s departure point. The scene is set from the moment you step into our authentic Edwardian waiting room. You will be guided by staff in full period uniform. Our river tours last approximately 45 minutes; whilst you pass several medieval buildings the punter tells you the exciting stories about Canterbury’s history.Alternatively the haunted tour takes place after dark. You will be told a series of short ghost stories which, when possible, seek to explain these supernatural manifestations. Sit comfortably on our spacious, cushioned seats and wrap up warm in our cozy tartan blankets. We can accommodate up to 48 passengers over four boats. Open for over 100 years and set within the 600 year old iconic Westgate Towers, the museum houses a collection of exhibits from its rich history as a city gaol and offers the most stunning views of Canterbury in all directions from the battlements viewpoint. 38 St Margaret’s Street, Canterbury CT1 2TY Contact: John Hippisley Tel: + 44 (0) 8455 190 267 Email: canterburyghosttour@gmail.com Web: www.canterburyghosttour.com An entertaining blend of history, humour and haunting amongst the old city. Tours can be arranged for groups of 15 to a maximum of 50+ during the day or evening but must be pre-booked. Tours and meal packages available. The Beaney Art Museum & Library provides state-of-the-art exhibition galleries with excellent learning facilities and a varied progamme of interactive events. The Beaney is also home to one of Canterbury’s most famous artists, the Victorian animal painter Thomas Sidney Cooper. This collection is of national importance and spans the full range of Cooper’s work.Permanent displays include over 1,000 objects with themes varying from Explorers and Collectors to People and Places. Collections span ancient Egyptian and Greek artefacts; objects from East Kent to around the world; birds and butterflies; stained glass windows; paintings and drawings, all of which are showcased in the permanent galleries alongside special exhibitions. Discover the colourful story of Canterbury from prehistoric times to the present day as you explore one of England’s finest surviving medieval buildings. From mighty mammoth tusks and AngloSaxon and Viking treasures, to pilgrim badges and possible marble fragments of Thomas Becket’s tomb, this gem of a museum is packed full of history. It also includes a wealth of fun, hands-on activities for all the family – from dressing up in historic costume to investigating medieval poo – and is home to the original Bagpuss and Rupert Bear. We offer a wide range of educational visits for British and foreign school groups and adults, including guided tours, object investigation sessions and interpreter-led workshops. Explore Canterbury’s unique underground Roman Museum, built around the remains of a fine Roman house, complete with in situ mosaic floors and under floor heating system. Discover the story of Roman Canterbury; investigate the marketplace; enter the Roman kitchen and dining room and see some truly incredible finds including possible evidence of a Roman murder and a magnificent hoard of buried Roman silver. With hands-on activities for families including handling real objects, trying on Roman costumes and armour, Roman board games, a mini archaeological dig and a chance to make a mosaic. We offer a wide range of educational visits for British and foreign school groups and adults, including guided tours, object investigation sessions and interpreter-led workshops. From Dambusters to Floods, and Piers to Punch & Judy, this delightful museum and gallery has plenty of surprises under one roof. Displays include local paintings, prints and photographs, prehistoric elephant tusks and fossils from local beaches, coastal wildlife and a Barnes Wallis Bouncing Bomb prototype from World War Two. The art gallery has a programme of regularly changing temporary exhibitions featuring touring shows, local history displays and work by local artists. Events include creative workshops and special activities for schools and groups and fun hands-on activities for families. Whitstable Museum & Gallery St Peters Place, Canterbury CT1 2DA Tel: + 44 (0) 1227 785 625 Email: masonicmuseum@btinternet.com Web: www.eastkentfreemasons.org/kent-museum-offreemasonry The Kent Museum of Freemasonry is a hidden treasure with a rare collection of exhibits of national and international importance and has one of the finest collections of Masonic material in the UK. Whether you are a curious browser looking for something interesting and unusual to do in Canterbury, a serious student of Freemasonry or simply interested in the history of the city and the county there is plenty to interest you. You will find a comprehensive history of Freemasonry, from its inception through to the present time, with emphasis on Kent, its lodges and their origins. As well as themed displays such as Notable Kent Freemasons and Masonic Military Heroes, other topical exhibitions are hosted throughout the year. 5 Oxford Street, Whitstable CT5 1DB Tel: +44 (0) 1227 862 162 Email: museums@canterbury.gov.uk Web: www.canterbury-museums.co.uk Discover the unique seafaring history of Whitstable, famous for its oysters, diving and celebrity residents! The Museum is packed with art, images, film and iconic objects; from a diver’s helmet and knife to the slippers in Cushing Corner, worn by the actor during the filming of Star Wars. The Gallery hosts a changing programme of national touring exhibitions and the cream of local and regional art. The Museum and Gallery is set in a delightful building dating back to the 1700s, with a lovely courtyard to sit in during the summer. It hosts a regular programme of drop-in ongoing activities for families as well as a traditional play shop and school desk. Contact us to book our Events Room for interpreter-led sessions or as a lunch venue. Teachers and group organisers are welcome to make a preliminary visit free of charge. Bekesbourne, Nr Canterbury CT4 5EL Tel: 01303 264 647 Email: group@aspinallfoundation.org Web: www.aspinallfoundation.org/howletts Howletts Wild Animal Park offers unique and fun filled days out for groups of all ages and sizes. See the world’s largest collection of western lowland gorillas and the UK’s largest herd of African elephants. Howletts is home to over 400 of the world’s most exotic and endangered animals including lions, tigers, black rhino, giant anteaters and many more. For a close encounter like no other, walk alongside and below our free roaming family of amazingly agile and lively lemurs at Walking With Lemurs. Or mimic the agile primates on the Treetop and Animal Adventure Challenge*. We’re also world renowned for our successful breeding programmes and commitment to conservation. Make your day extra special by booking talks, guided tours, team building activities and lunches. Mount Ephraim Gardens is set in ten glorious acres of stunning Edwardian terraced gardens against a backdrop of the beautiful Kent countryside. The elaborate and unusual topiary with a miscellany` of birds, animals and First World War memorabilia in clipped yew truly captures the imagination. The Millennium Rose Garden abundant with scented roses and a traditional herbaceous border complete this stunning area. The gardens also feature a Japanese rock garden, water garden and lake, arboretum and a spectacular grass maze with a play area for children. It is a place of tranquility and charm so often lost in larger more impersonal gardens. Barnsole Vineyard Fleming Road, Staple, Canterbury, CT3 1LG Tel: +44 (0) 1304 812530 / 07770 482 883 / 07772 300 511 Email: vineyard@barnsole.co.uk Web: www.barnsole.co.uk Visitors are most welcome to the seven acre vineyard and winery. The first phase of plantings go back to 1993 with additional plantings added in 2012. Barnsole produces 15,000 bottles per year. We make and sell still white wine, still red wine and English sparkling wine directly from the winery door. Visitors can see how the vines are grown and the wine produced. Tastings are free. Or a more in depth tour can be enjoyed for a small fee. Druidstone Honey Hill, Blean CT2 9JR Tel: + 44 (0) 1227 765 168 Web: www.druidstone.net Set in attractive gardens and woodland, Druidstone caters for all ages. The bluebell wood is part of The Blean, one of the largest and most distinctive areas of woodland in the south east and home to our herd of white fallow deer. Visit around Easter and enjoy the breath-taking display of bluebells in the woodland. Summer brings the budleja (butterfly tree) into full glorious flower. During autumn you can discover the woodland fungi and winter buds, whilst throughout the year rhododendrons, conifers and other well established shrubs and trees make the park a delight to visit. The farmyard animals, including chickens, sheep, goats, llamas, ponies, a donkey and the naughty pigs are always keen to say ‘hello’. Canoe Wild George & Dragon, King Street, Sturry, Fordwich CT2 ODB and Grove Ferry Picnic Site CT3 4BP Tel: +44 (0) 1227 469 219 Email: doit@canoewild.co.uk Web: www.canoewild.co.uk Canoe Wild offers unguided canoe hire, guided tours, parties and courses for all ages along the picturesque River Stour. Discover the areas rich history dating all the way back to the Vikings, and the abundance of the wildlife, such as kingfishers, swans and marsh harriers along the river. At each end of the journey are great pubs and picnic site, where you can relax before we give you a lift back. We provide an excellent environment for outdoor learning, suitable for all schools and youth groups. Incorporating Canterbury, Whitstable and Herne Bay Cycle Hire 61 Harbour Street Whitstable, Kent CT5 1AG Tel: +44 (0) 1227 388 058 Email: info@kentcyclehire.com Web: www.kentcyclehire.com We provide high quality bicycles, fully equipped including helmets, locks and maps of our local routes as well as helpful advice and guidance on the day. We provide bikes regularly for groups both large and small, from hen parties and Scout troops to a Swiss choir of 32 and a group of 116 Swedish health workers. One way hire available; you can pick up and drop off your bikes at Canterbury, Whitstable or Herne Bay. We offer a high quality service requiring full details of the age, height and gender of each cyclist so that we can prepare the bikes in advance and have a named, numbered bike ready and waiting for each cyclist. Kent County Cricket Club The Spitfire Ground St. Lawrence, Old Dover Road, Canterbury CT1 3NZ Tel: +44 (0) 1227 456 886 Email: oliver.day.kent@ecb.co.uk Web: www.kentcricket.co.uk Few clubs can claim the heritage that Kent can. Official histories register a Kent team playing in 1705, with the first recognized county game, between Kent and Sussex, taking place in 1728. Kent plays in the national competition, in the three different forms of the game with the countyâ&#x20AC;&#x2122;s one day team known as the Kent Spitfires. The Club welcomes groups and school parties to the St Lawrence Ground; packages can be arranged to include food and drink, as well as tickets to a match. For school groups a teacher goes free. Groups can also be part of the great game and experience the fun and action of modern cricket. Learn to bat, bowl and field in a 90 minute session using the same facilities the professionals use. 11 Horsebridge Road, Whitstable CT5 1AF Box Office: +44 (0) 1227 281 174 Email: info@horsebridge-centre.org.uk Web: www.horsebridge-centre.org.uk This striking copper-domed roof building offers three versatile gallery spaces with new exhibitions weekly. It features works from local art societies from solo and international artists. There is also a large performance space area that hosts gigs and events every week and a café. pantomime production that is one of the most popular in the South East. The Marlowe Theatre offers great facilities for group visits with an on-site restaurant offering a high quality and varied menu, meeting spaces, party nights and generous ticket discounts on most shows. The King’s Hall University of Kent, Canterbury, Kent CT2 7NB Tel: +44 (0) 1227 769 075 Email: boxoffice@kent.ac.uk Web: www.thegulbenkian.co.uk The Gulbenkian welcomes groups visits. Whether you are travelling as an educational or youth group or planning an outing with a group of friends, contact our friendly Ticket and Information team members who will be happy to advise on events and booking a table at our lively cafe to make your visit easier and even more enjoyable. refreshments and light snacks. Located in Herne Bay, The King’s Hall is an architectural gem, captivating visitors with its original Edwardian features and idyllic seafront views. Playhouse Theatre 104 High Street, Whitstable, CT5 1AZ Box Office: +44 (0) 1227 272 042 Web: www.playhousewhitstable.co.uk The Playhouse Theatre is situated in the heart of Whitstable and is owned and operated by the Lindley Players. As well as being the venue for all of the Lindley Players productions the theatre is used by many local groups, musicians and acts, both amateur and professional. Box office open 10 to 12 noon Monday to Saturday. Getting Here The Canterbury district has excellent road links with the M20 (M25/M26) and M2 motorways providing easy links from London and its airports. Rail links from St Pancras will whisk you to Canterbury in just under an hour. Other central London stations to Canterbury are Victoria and Charing Cross. Canterbury is also approximately 30 minutes drive from Dover and 20 minutes by rail from Eurostar/Ashford International. Canterbury Coach Park is approximately a 10 minute pleasant riverside walk from the city centre. The coach park is easily accessible from the main routes into the city with parking machines accepting credit cards and cash. Toilets including disabled, baby changing facilities and water points are available.